I was honored and grateful to be interviewed for this new book. 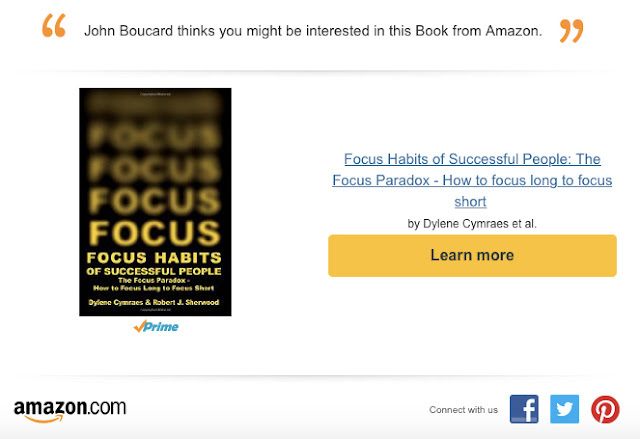 Focus Habits of Successful People: The Focus Paradox - How to focus long to focus short. Focus may be a new way to look at your life, at the highest level. When you look at your life in a spiritual sense, what does it mean to you to be successful? Life is finite time. Realizing this, what will you focus on? Focus is a way to improve your chances to attain your goals. We can think about the old concept of focus in a new way. Lack of focus causes frustration, but intentional focus creates success. “You are known by what you focus on.” This statement was made in one of the discussions surrounding this book. Once in a while, when working on something of this nature, a core truth leaps out of the text and refuses to go away. This is an observation that deserves some thought........ AND MUCH MUCH MORE. 125 pages of how to focus by reading about how successful people do it.